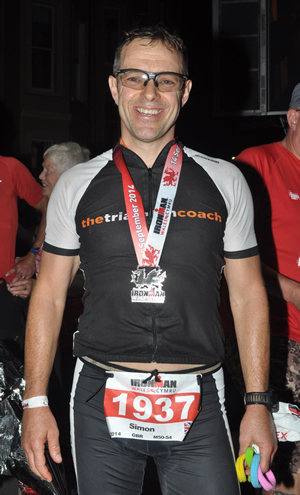 Ironman Wales may have been his tenth full-distance Ironman™ event, but for Simon Ward it "was my hardest Ironman ever". That said "I loved every minute of it"! Ironman Wales was my second event of this distance in 2014. Since Lanzarote back in May, I have ridden Lands End to John O'Groats (960 miles in 9 days), lost 2kg in weight and continued an amazing run of health with no injuries or illness to disrupt training. As I arrived in Tenby on the Wednesday, I was feeling much more confident about this race. The weather forecast for race day was just about perfect: warm with a lowish wind speed. The only possible issue was that any wind was coming from the East, directly into the bay where the swim was due to take place and coinciding with an incoming tide. We were currently in a “supermoon” phase which meant that tides had been particularly high, although they are quite big in this area anyway. I swam on all three days prior to the race for about 15-20 minutes and at the exact race start time. The sea was choppy but I quite like that so I was feeling happy. On race day, when we arrived at the beach the tide was still out. Some of the marker boys were still resting on the sand but by 6.50 the on-rushing tide had floated these and we were good to go. The breeze was quite stiff and combined with the tide meant we had some big waves to work through, and in general there was a big swell and significant chop. I think Fraser Cartmell (who went on to finish second), referred to it as “formidable looking” and he's an excellent swimmer. Like Fraser, I too felt sorry for those triathletes who don't really enjoy open water swimming. This was going to be a very tough start for them. My plan was to get right to the front of the Age Group wave and smash the first 400m to try and get some clear water. I did just that but I needn't have worried as the rough sea spread the field out anyway. The course was a squashed triangle. We headed out at 45 degrees to our left, appropriately to where the lifeboat was waiting, made a sharp right turn around the biggest swim buoy I have ever seen (it must have been 3-4m high), swam the longest leg parallel to the beach (appropriately enough again, towards the lifeboat station), and rounding the other largest ever swim buoy, made another sharp right turn and back to the beach. I felt like I was swimming forever and with no one around me. Then I breathed to the right and saw a group on my inside. Once on the beach there was a 100m Aussie exit before the start of lap two. I didn't have a clue about my position so I just followed the group and tried as best I could to get on some feet. This was easier said than done. One moment you'd be right behind a swimmer, the next five metres to their left. With the tide coming in, the long leg parallel to the shore was a challenge. If you didn't sight (and correct direction) every other stroke you just went too far right. Again this must have been a challenge for those who don't look up that often. For all the hard work, I loved this swim. The sprint training I have done at Leeds Masters this year has really improved my arm cadence and this is where it really showed. In these conditions you can't finesse your stroke. It needs to be effective, not pretty, and any sort of ‘dead spot' or glide at the front end would have resulted in me going backwards. All too soon I was back at the beach (why aren't there races with an 8k swim, 200km bike and 20k run?). I still had no clue about my time or position although it turns out I was third in my Age Group (about where I wanted to be), 56th overall (out of 1900) with a time of 1:03 (about 9-10 mins down on normal). The further down the field you go the deficit is exponential as slower swimmers have to work harder in the conditions and fatigue quicker. It should be no surprise that almost 90 people didn't actually finish the swim (just under 5% of the field). It is worth bearing in mind that the average drop out rate for a whole Ironman event is about 6-7%, so to have this high a figure in the first two hours demonstrates how tough it was. 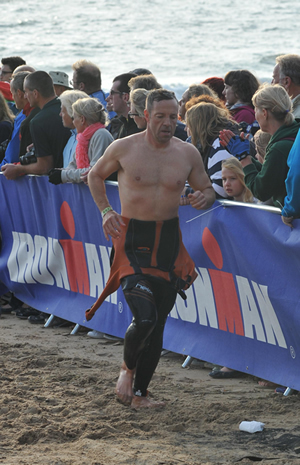 Ironman Wales is a bit more than just a triathlon, it's swim, run, bike, run. The first run is 1km from the beach to T1 but this adds about 6-8 minutes to the total race time. This time I used a power meter rather than HRM so I was keen to see what difference it made. The problem is that the Wales course has so much up and down and seven hills of 10-15% that keeping power down to an acceptable level is much more difficult. Hills like Wisemans Bridge and Saundersfoot are 15% and you have to push over 300 watts just to stay upright. My goal was to keep my Normalised Power at 70-75% of FTP. The Stages power meter I have reads about 15-20 watts under the Computrainer, so I had to ride use an NP of 190-195 as my target. Normally I would have been aiming for 210-215watts. The first part of the route was reasonably flat and with a tail wind. Easy to feel like a hero on this stretch so I had to really hold back a bit. At the far end of the first lap we turned back towards Tenby and into the headwind. Now it was time to push on a bit…but not too much. I'd been overtaken by quite a few riders at this point but I didn't recall seeing any in my Age Group. The two hilly laps started at Lamphey and from this point until we got back to T2 it was relentless. There was only one real flat stretch of about 2-3 miles and the rest was either climbing or descending. Approaching Tenby we had the two hills I just mentioned so it was worth holding back. The crowds on St Brides Hill in Saundersfoot reminded me of the one we spectated on near Howarth when watching the TdF. 4-5 people deep for the 200 or so metres of the climb, closing in near the top so that only one or two riders could squeeze through. I couldn't stop smiling. It was fantastic. Once again it would have been easy to play the hero and power up in a big gear but I knew we had one more lap and the run. I kept whispering “running legs, running legs” to myself in a bid to hold back. At this stage it's worth saying that it wasn't just this hill which had spectacular support. Each of the villages had come out in force and any hill was just like a mini Alpe d'Huez. I smiled like a lunatic on all of them and when it was flatter just got on my aero bars and applauded the crowd. That just provoked more cheering and clapping. By the time I got back to T2 I thought I'd be well down but as I found out later I had the fifth fastest bike split and was still 5th or 6th in my Age Group. This is normally my weak spot. Years of injuries and interrupted training mean I have a low confidence in my running ability. I'm not a bad runner, but I just don't have the consistency. In Tenby I'd ridden over the course and counted nine hills on each lap…and nine descents (an important consideration when thinking of the general physical toll on the legs). I just went by pace/average pace on my Garmin. The first part of the lap was generally uphill and the back half downhill. At the end of lap one I was averaging 5:52/km and by the end of lap two it was up to 5:56. Still, I'd run all of the hills and just walked through every other aid station to take a gel and some water. The run route was an out-and-back with the final 2-3km twisting its way through the narrow streets of Tenby. Actually, they probably aren't that narrow…normally, but on race day they were packed. It looked like all of the spectators from the bike course had just de-camped to the town. There was no way anyone could walk these streets. The crowd almost pushed and pulled you through. 25km in and the wheels fell off. I was outside of town then and just passing the first aid station. Actually it felt like I needed first aid. I just started retching and then puked a bit. After that I felt a bit dizzy and started getting some palpitations. Sensibly or stupidly depending upon your perspective, I decided not to seek medical help and just sat down for a bit on the wall outside a house. A lovely old lady came out to ask if I was Ok, gave me a drink of water and then rubbed my back as if winding a baby. “Ok, so I have been here before” I thought. I told myself “Just keep moving towards the finish, stay upright and don't fall over like that guy you saw earlier. He's probably in hospital by now”. 10 miles isn't that far when you are feeling good. Its a f*****g long way when its FUBAR. Anyway I just tried to keep walking and jogging. You've probably all been there. I have and more times than I care to remember, so it's kind of familiar. Eventually you always get to the finish but this time I couldn't muster up a sprint. I decided just to use the crowd. Shuffle 100 steps and high 5 some kids. Shuffle 50 more and hug a volunteer. Another 50 and shake hands with some drunkards outside a pub. I was actually having quite a good time. Finally, after 13hours and 10 long minutes I crossed the line. 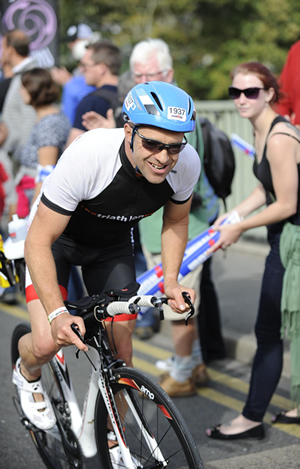 Ironman Wales was my hardest Ironman ever. I know we all say that at the end of a race, but it truly was. This sounds a bit messed up but I loved every minute of it. Anyway there's lots to be happy about. I think I was still in the top 10 in my AG at 25k into the run so I'm getting close. Another winter of running without injury, more bike miles and a couple of kg's lighter and I'll be closer still. But that's for later. Now it's time to turn my back on tri training for a while, become a non-triathlete and Get Out Of Shape. It's been an action packed year and I'm just grateful that at 50, I can still do all of this. Fiona Hoare - my best friend, life partner and training partner. Blue Seventy - awesome wetsuits. I've still not managed fastest in my AG yet but maybe the 2015 Helix will give me those extra few seconds I need. Impact CT and Fondriest bikes - My Fondriest Chrono TT may not be that well known among triathletes and I've never seen another one in any of the races I've done this year, but it is really comfortable and handles really well. I love it. Thank you Brian Stanwick for making this happen. AMP Hoops - Great wheels and fantastic support from Mark. Skechers - They may not be to everyones taste, but I love these shoes and once again the support from Brett Worth has been brilliant. When I needed a new pair they arrived 48 hours later. Chevin Cycles - My local bike shop in Otley who maintain all of my bikes. If all I did was buy from Wiggle or CRC there's no way I could drop in at the last minute and get my gears sorted. Support your local bike shop! It might seem like you pay a bit more but service like this is priceless!! Tri 247 - Andy Tomlinson put this whole project together so without him there would have been no Hawaii50. 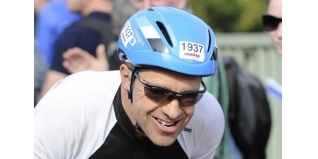 John Levison has posted all of these blogs and Paul Shanley sorted my entry for Ironman Wales.